Prominent French composer and conductor Pierre Boulez had imagined 2 programmes with the London Symphony Orchestra around works from the 1st half of the 20th century from Claude Debussy, Karol Szymanowski, Alexander Scriabin and Béla Bartók. Due to a recommendation from his oculist, he had to step down for both evenings and chose Peter Eötvös to replace him. 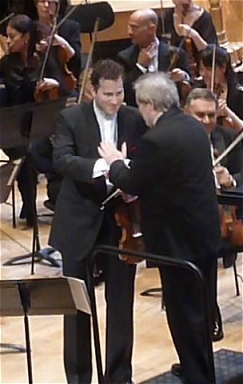 The 2 men know each other well, and the Hungarian conductor is also a recognized composer. The 1st evening in Salle Pleyel started with Debussy’s Nocturnes, a 3 part work, with a sumptuous orchestra – plus a chorus for the last piece – prefiguring La Mer. A beautiful opening which allowed enjoying the quality of the LSO instrumentalists. The second work was Szymanowski’s 1st Violin Concerto, a magnificent and underrated piece. 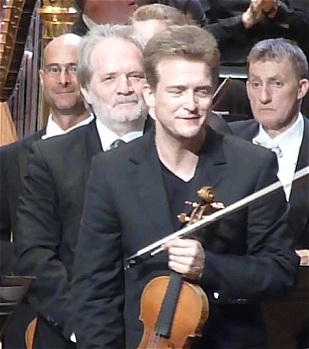 Christian Tetzlaff, one of the most remarkable violinists of our time, showed a deep understanding of the music on top of an exceptional technique. After the intermission, Peter Eötvös conducted Scriabin’s Poem of Ecstasy, whose musical world is as personal as Szymanowski’s or Bartok’s, making the orchestra almost incandescent. The 2nd evening was dedicated to Hungarian and Polish music. Peter Eötvös and the LSO played Bartók’s extraordinary Music for Strings, Percussion and Celesta. If the introductory Andante tranquillo – definitely the most beautiful orchestral fugue written since 1900 – did not swell from near silence to its incredible climax (as when played by some other conductors) the climax itself and the waning, as well as the rest of the work were a joy to the ear, the heart and the brain, underlining the brilliant structure of the piece, the variety of moods and effects, the beauty of melodies and the importance of rhythm. The second work was Bartók’s 2nd Violin Concerto, another masterpiece, another chance for the orchestra to shine, along with the soloist. Nikolaj Znaider tone seemed probably a little tense in the very first bars, but he quickly showed all his musical and technical skills. The concerto is based on the idea of variations, the central slow movement being in the form of variations on a theme, and the 3rd movement being a variation of the 1st! Again a joy to the ear, the heart and the brain. Nikolaj Znaider gave a superb and moving encore, Bach‘s Sarabande from the Second Violin Partita. The concert ended with Szymanowski’s 3rd Symphony “Song of the Night”, which is extremely rarely played – or even recorded, Pierre Boulez recent and excellent CD being a notable exception! The symphony is a strange but powerful work, with a tenor (here Steve Davislim) and chorus, on an old Persian poem. The performance of Eötvös at the head of the LSO and Chorus was excellent. This entry was posted in Classical concert and tagged Christian Tetzlaff, LSO, Nikolaj Znaider, Peter Eötvös, Pierre Boulez by MichelE. Bookmark the permalink.